Environmental issues, particularly but not only climate change, are once again prominent in the public eye and their importance has been reflected in frequent posts over the years in Pearls & Irritations. We can also be certain that a range of environmental issues will feature strongly in the forthcoming Federal election, particularly for instance climate change and carbon dioxide emission reduction targets, energy policy, the proposed Adani mine, fracking, the Murray Darling River, the Great Barrier Reef and land clearing. Some issues will assume greater importance in some electorates than others. Disappointed by the slowness of national governments and inter-governmental organisations to tackle climate change? Michael Northrop from the Rockefeller Brothers Fund highlights commitments by states, cities and companies at the Global Climate Action Summit in San Francisco in September 2018 to reduce greenhouse gas emissions in buildings, transportation, ports, renewable electricity, waste, land use and oceans and through finance. Climate change isn’t the only environmental problem. Humans are changing the environment and ‘earth systems’ in many other ways, creating a new geological epoch: the Anthropocene. This article, from AsiaGlobal Online, discusses how climate change and the Anthropocene are related but not synonymous. A frank assessment by Giles Parkinson of where the Federal Government’s energy and climate policies stood at the end of 2018 and what the state and territory governments think about it all. A picture may well be worth a thousand words but when it comes to promoting awareness of and action to combat climate change make sure those pictures include ordinary people suffering the consequences or taking action. Viewers are much more engaged by pictures that tell a human story that engages their emotions than ones that may be artistically striking and praiseworthy but devoid of human content. Talking of pictures, Jack Waterford discusses the causes and political implications of some pretty dramatic ones of dead fish from the Murray River and Menindee Lakes this week (most photos did include some local people!). As he says, ‘The fish don’t need a detailed inquest: just by themselves, they show that something has gone very badly wrong.’ Few parties emerge from Mr Waterford’s scathing analysis with any credit. And finally there is a graph from the Bureau of Meteorology that very clearly shows how Australia has been getting hotter. 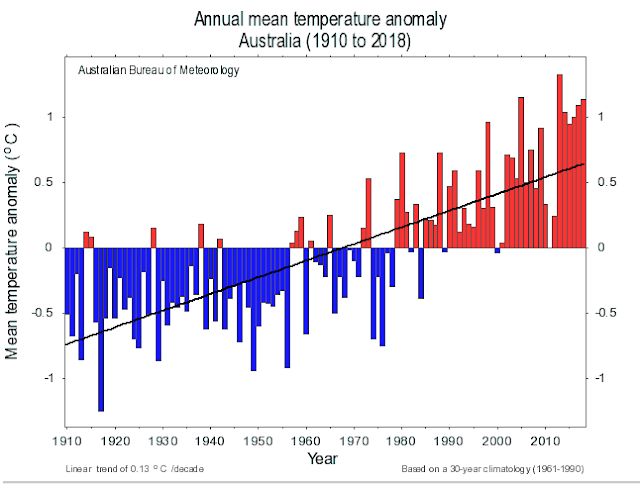 The graph shows Australia’s mean temperature anomaly for each year from 1901-2018. The annual temperature anomaly is the difference between the average temperature for that year and the average for the years 1961-1990. Yes, there were warmer than average years in the first half of the 20th century but it’s clear that before 1957 the vast majority of years were considerably colder than the 1961-1990 average, whereas after 1978 they were mostly warmer than the average, and increasingly so. Statistically the warming has been 0.13 degrees C per decade from 1910-2018. The media loves headlines and pictures about record temperatures across the country but seldom makes as prominent the links to the underlying global warming. Thanks for this new initiative. I think it is useful. However, just a minor point. I wonder if Jack Waterford’s article was worth a mention. I don’t think it is nearly as good as the article by Michele Pini, on the same subject, which was posted on Pearls & Irritations earlier in the week. There is a page on Facebook, Skeptical Science, that does a weekly roundup of peer reviewed journals on climate change. Thanks Peter, and John, much thanks for this initiative.